OPEN HOUSE — Old College Hall at Pacific University hosts an open house Wednesday, April 3, 1 to 3:30 p.m. Old College Hall was built in 1850 as Pacific's first university building. Today, it is one of the oldest educational buildings still in use west of the Mississippi River. The hall has been moved three times and now stands on the southwest corner of the Forest Grove Campus. The cupola, or bell tower, has become a symbol of the university's history, and the old bell still rings to commemorate special events. Students ring the bell one by one at the beginning of their academic careers, and again upon graduation. The museum features a collection of artifacts from the history of the school and the Forest Grove region. 2021 College Way, Forest Grove. Free. 503-352-3096. SPRING BREAK — Valley Art presents Spring Art Break for Kids from 1 to 3 p.m. March 26 through March 28 — three days of artistic engagement with the option to choose which days suit your child's interests. Choose one, or all for discount: Tuesday is Paint 4 Kids, Wednesday is Free Create, Thursday is Clay Day. Admission is $20 each, or $50 for all three classes. Space is limited. Closed-toe shoes are required. Recommended for ages 7 and older. Valley Art is located at 2022 Main St. in Forest Grove. Register online at artingales.org/calendar. For more information, visit valleyart.org/classes. GRAMMY-NOMINATED — The Glenn & Viola Walters Cultural Arts Center presents Robbie Fulks on Friday, March 22, at 7:30 p.m. Incorporating folk, bluegrass and vintage country, Robbie Fulks' new album, "Upland Stories," is garnering some of the most effusive reviews of his career, along with two Grammy nominations for "Best American Roots Song" and "Best Folk Album." Fulks' rich, emotional storytelling is illuminated by his instrumental prowess and stirring vocals. Tickets cost $18 in advance or $22 on the day of show. Tickets cost $5 in advance or $8 on the day of show. Walters Cultural Arts Center, 527 E. Main St., Hillsboro. Visit hillsboro-oregon.gov/Walters or call (503) 615-3485. For more information, visit robbiefulks.com. NATIVE AMERICAN FLUTE — Pacific University presents R. Carlos Nakai, the world's premier Native American flute performer, April 6 at 7:30 p.m. Nakai brings his award-winning music to the Pacific stage with percussionist Will Clipman at the Taylor-Meade Performing Arts Center, located at 2014 Cedar St. in Forest Grove. $22.50 to $25. Visit pacific.edu/performing arts, 503-352-2918. RHYTHMS — The Glenn & Viola Walters Cultural Arts Center at 527 E. Main St. in Hillsboro presents Neftali Rivera and Grupo Borikuas in concert April 19th 7:30 p.m. Neftali Rivera and Grupo Borikuas capture the essence of Puerto Rican, Cuban and Afro-Caribbean rhythms. $12 to $16. Visit hillsboro-oregon.gov/walters,503-615-3485. GRIEF DISCUSSION — The Forest Grove City Library is hosting a presentation and discussion about grief Wednesday, March 20, at 6:30 p.m. in the Rogers Room. Three presenters will be in attendance including Steve Dehner, author of "At a Loss: How to Help a Grieving Friend," retired chaplain Dexter Danielson, and counselor William Feldman. Free to the public. AUTHOR TALK — Investigative reporter and journalist John Dodge will speak on Tuesday, April 2, at 6:30 p.m. in the Rogers Room about his recently published book "A Deadly Wind." The story tells the tale about the 1962 Columbus Day storm. Book signing to follow. Free to the public. MAKER FAIRE — Hillsboro Brookwood Library presents Westside Maker Faire on Saturday, March 23, from 11 a.m. to 4 p.m. Join local makers to learn about their recent creations and get ideas for your own projects. Free to attend. For more information, visit Hillsboro-Oregon.gov/Library. 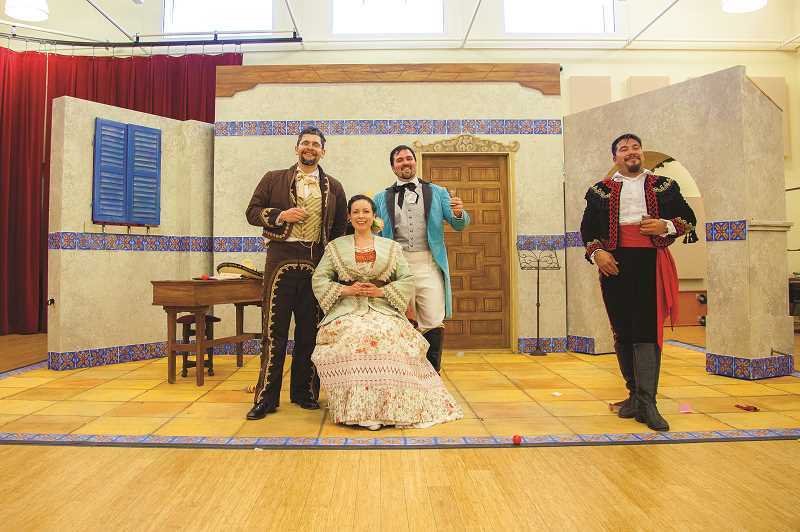 PORTLAND OPERA — Hillsboro Brookwood Library presents Portland Opera Season Preview on Sunday, March 31, at 1 p.m. Join members of the Portland Opera as they perform a set of featured songs from the upcoming season of shows. Free to attend. Hillsboro Brookwood Library, 2850 N.E. Brookwood Parkway, Hillsboro. Visit Hillsboro-Oregon.gov/Library for more information. A LEAGUE OF THEIR OWN — Sherwood Center for the Arts at 22689 Pine St. will present "A League of Their Own" as part of its Classic Film Series on Thursday, March 21, at 7 p.m. As America's stock of athletic young men is depleted during World War II, a professional all-female baseball league springs up in the Midwest, funded by publicity-hungry candy maker Walter Harvey. Competitive sisters Dottie Hinson and Kit Keller spar with each other. Sweet treats and popcorn will be available for purchase. Doors open at 6:30 p.m. $3 for all ages. Visit SherwoodCenterfortheArts.org or call 503-625-4278 for more information. THE ISLAND IN WINTER — Bag&Baggage Productions' inaugural Problem Play Project production is a remarkable new vision of Shakespeare's "The Winter's Tale" in a bilingual world premiere adaptation. The Bard's spellbinding tale of jealousy, prophecy, magic, and redemption, reworked by Hillsboro native Carlos-Zenen Trujillo, transports the action away from Sicilia and Bohemia to Miami and Havana. Bringing Latin American magical realism to play in one of Shakespeare's most compelling (and magical) tales, "The Island in Winter" is the first show in a three-year project that asks emerging playwrights of color to re-imagine Shakespeare's Problem Plays with a diversity and equity lens. Shows run through Sunday, March 24, at The Vault Theatre, 350 E. Main St. in Hillsboro. Tickets are $32 for adults, $27 for students and seniors. SEASONAL BUGS — On Tuesday, April 2, at 6:50 p.m., the Washington County Master Gardeners Association holds its presentation, "Seasonal Bugs and Beasties, at Beaverton's Griffith Park Building, Room 330, 4755 S.W. Griffith Drive. No registration needed and parking is free. Each season brings different bugs into our gardens and homes. Some of these are beneficial, at least in the garden, while others are problematic. In this presentation, Jean Natter describes some of the critters that greet us and offers suggestions for effective and appropriate responses. NATIVE PLANTS — On Thursday, April 4, from 10 a.m. to 11:30 p.m. at the WCGMA Learning Garden at Jenkins Estate, 8005 S.W. Grabhorn Road in Aloha, the Washington County Master Gardener Association holds its presentation, "Growing NW Native Plants" with speaker and master gardener Ardis Schroeder. Schroeder will answer such questions as, "What is the definition of a native plant?" and, "What specific Northwest native plants will grow well in my yard or garden?" Use the Camp Rivendale entrance, park and then walk past play structure down to the Learning Garden. No registration needed. Free parking.